The ancient Egyptians remained very conscious of social stratification, and barriers between the classes were quite rigid. Climbing the social ladder was difficult, but it could be achieved through outstanding accomplishments in professions such as that of the scribes and the military. The military took part in warfare and trade missions, helping to maintain Egypt's sovereignty and expand its territories. The deserts and the Mediterranean gave the country a natural means of protection. Still, invasions did occur. 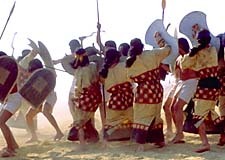 In the Old Kingdom, the small military units were reinforced by farmers when necessary. During times of internal instability, private armies were established, which included non-Egyptian mercenaries. 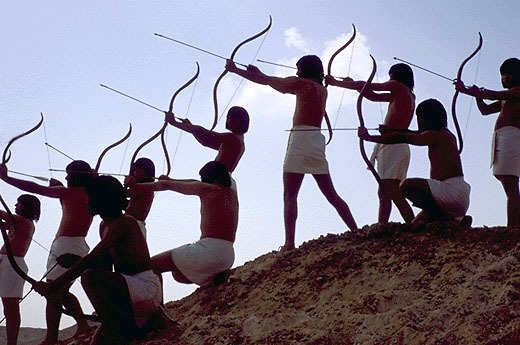 During the reign of Ramses II (New Kingdom), vast improvements were made in military technology and tactics. The Narmer palette is the earliest artifact depicting an Egyptian king wearing the crowns of both Upper and Lower Egypt. It commemorates King Narmer's victory over Lower Egypt and the subsequent union of Upper and Lower Egypt in the late Pre-dynastic Period (3000 B.C.). Although Egypt was sometimes ruled by foreign princes during the pharaonic period, it continued to maintain its independence. 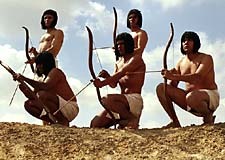 Over the centuries, the power of the pharaohs increased and decreased numerous times before Egypt came under foreign rule. Around 1000 B.C., Egypt was virtually bankrupt and its strength began to decline. The Persians and the Macedonian Greeks were the first foreign powers to rule the country. In 350 B.C., a new Persian ruler, Artaxerxes III, attempted to invade the country but failed. Seven years later, Egypt did fall to the Persians, during the reign of Nectanebo II, the last Egyptian pharaoh. According to Greek accounts, the Persians were cruel masters, robbing temples, killing sacred animals and burdening the people with taxes. The Macedonian Greek emperor Alexander the Great waged a campaign to destroy the Persian empire. When he entered Egypt in 332 B.C., he was hailed as a divine being and saviour. He hastened to Memphis, performed a sacrificial ceremony to the Apis Bull and was accepted as the new pharaoh. The founding of the city of Alexandria , on the Mediterranean coast, marked the beginning of the end for ancient Egypt.